From 23 October 2018 — 20 January 2019 Medicine Bakery + Gallery will be filled with procession banners. In collaboration with artist Lucy Orta and Ikon Gallery, the exhibition has been produced in memory of 1,000 suffragettes that were imprisoned at Holloway women’s prison during their struggle to obtain the vote. Procession Banners joins a wider programme of events happening across the country to commemorate 100-years of the Suffragette movement. In 1918, following years of bitter struggle, (some) women finally gained the right to vote. Earlier this year artist Lucy Orta collaborated with female residents of HMP Downview. Commissioned by Historic England, they collectively designed and created 30 banners to mark 100 years since this important occasion. HMP Holloway in London was one of the most notorious sites associated with the Suffrage movement. As the largest all women prison in Europe at the time, over 1,000 suffragettes were imprisoned there. Suffragettes incarcerated there suffered hunger strikes as they continued their campaigning from within the prison walls. It closed in 2016 and women prisoners were transferred to HMP Downview. 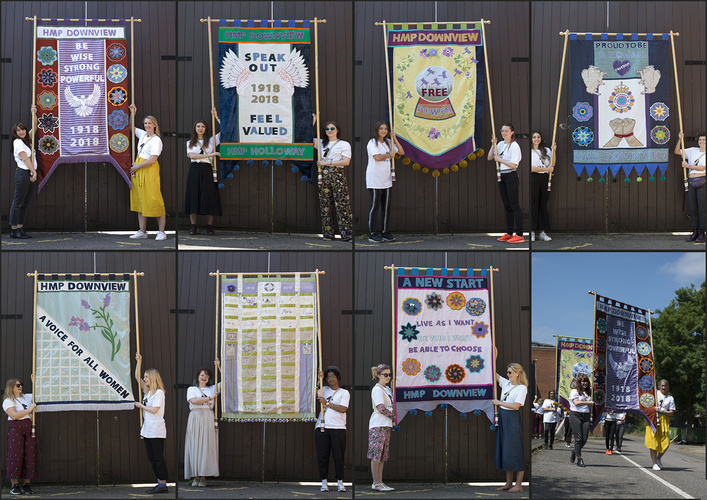 In January 2018, Lucy Orta began engaging women across the prison in a process that led to the creation of a series of commemorative banners for a centenary procession at the site of the former Holloway prison. This was followed by the women’s centenary Processions march, produced by Artichoke which took place simultaneously in London, Cardiff, Edinburgh and Belfast on 10 June 2018. Seven banners were carried by London College of Fashion students. 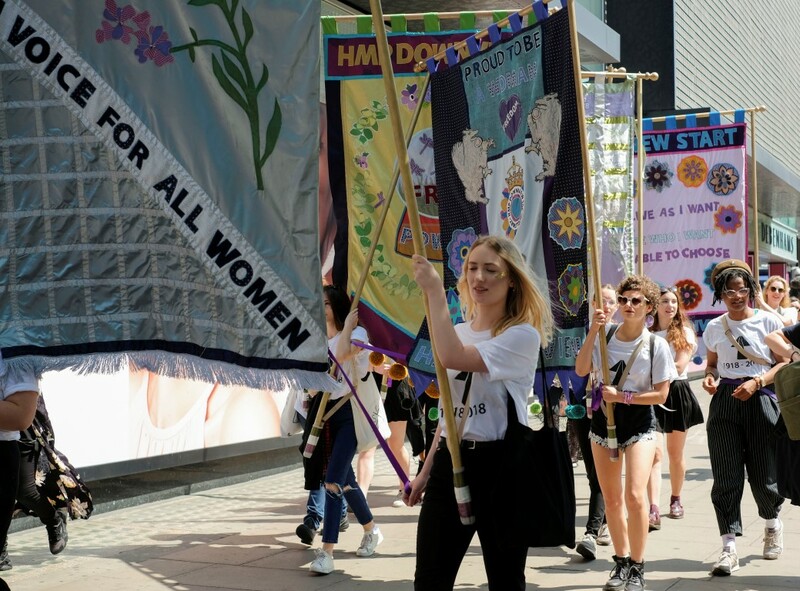 The designs for the HMP Downview procession banners draws from historical perspectives on the Suffragette campaign, hand-crafts and responsive workshops to collect testimonies, considering what it means to be a woman today, the power of the vote and our shared future. The hand-embellished panels were assembled collaboratively in Making for Change, an education training facility at HMP Downview established by the Ministry of Justice and London College of Fashion (LCF) that equips prisoners with employability certifications before the end of their sentence. Lucy Orta with women at HMP Downview Prison and student volunteers from LCF, coordinated by Social Responsibility at LCF. The mass-procession was a living, moving portrait of women in the 21st century. Photography: Michelle Marshall and Lance Tabraham. Ikon will exhibit a selection of these banners for the first time at Medicine, the former gallery of the Royal Birmingham Society of Artists, based on New Street. Originally from Sutton Coldfield, Lucy Orta trained as a fashion designer at Nottingham Trent University. Now based in Paris, she has become known for her innovative, socially driven work. Much of her practice investigates the boundaries between the body and architecture, exploring their common social factors, communication and identity. She uses the media of drawing, couture, sculpture, performance, video, photography and public interventions. Her early sculptural work examines the boundaries between the body and architecture, investigating their common social factors such as communication and identity. She invented Refuge Wear and Body Architecture (1992–98); Nexus Architecture (1994–2002) and Urban Life Guards (2004). Her work has been the focus of major shows at Musée d’art Moderne de la Ville de Paris, France (1994); Weiner Secession, Austria (1999); Museum of Contemporary Art, Sydney, Australia (1999); University of South Florida Contemporary Art Museum, USA, for which she received the Visual Arts Award from the Andy Warhol Foundation (2001); and at the Barbican Centre, London (2005). She is the youngest female artist to be the focus of a publication in the Phaidon Press contemporary artist collection (2003). Please note Medicine Bakery is only accessible via a steep staircase. Birmingham Museum & Art Gallery will also be holding an exhibition – ‘Women Power Protest’ – to mark a century since the first women won the right to vote. You can read more about their exhibition, which runs from 10th November 2018 – 31st March 2019, here.